Posted on June 9, 2017 at 10:02 am. The Yorktown Theater Dept. received the 2017 F. Loren Winship Secondary School Theatre Award from the American Association of Theatre Educators. This award honors an individual or organization for long-term outstanding contribution to the mission of secondary school theatre. It is named in honor of F. Loren Winship, director of drama and theatre activities for the Texas University Interscholastic League, whose efforts helped Texas become the first state to adopt a certification program for high school drama teachers. Given in honor of those pioneer educators in high school theatre who established the secondary school theatre movement in the United States. Oakridge Principal Dr. Lynne Wright and her family were honored guests of the Sudanese American Community Development Organization (SACDO) last Saturday Night. 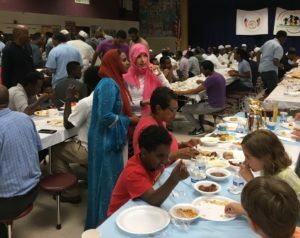 Over 500 community members celebrated the Ramadan Iftar dinner together after which Wright spoke to the group as part of the special program. Langston teacher Iris Gibson will be joining the Richmond Federal Reserve Board’s Teacher Collaborative Committee for the 2017-18 school year. The Teacher Collaborative Committee helps develop the Richmond Federal Reserve Bank’s economic and financial education resources and programs, guides outreach to teachers and students, and discusses best practices. Arlington Transportation Partners awarded Discovery the Silver Level Champion for the school’s efforts around Bike and Walk to School Day. Parent Resource Center coordinator Kathleen Donovan was selected as the recipient of the 2017 NAMI-Arlington Recognition Award. This award is given annually to an individual or organization that has contributed to enhancing services and/or quality of life for individuals with mental illness. The award recognizes Donovan’s 26 years of work at Arlington Public Schools in the special education field. NAMI, the National Alliance on Mental Illness, is the nation’s largest grassroots mental health organization dedicated to building better lives for the millions of Americans affected by mental illness. Yorktown senior Bilguunzaya Battogtokh was recently published in a science journal. She has been working at the National Institute of Health for the past two years with a mentor and she just became the lead author of the research they have been doing. She has also been invited to speak at Science conferences and universities. Also in "June 12, 2017"